The incenter of a triangle or regular polygon is the point where the angle bisectors meet. In any triangle, the bisectors of the interior angles always meet at a single point - the incenter. For more on this see Incenter of a triangle. The interior angles of any regular polygon always intersect at a single point - the incenter. For more on this see Incenter of a polygon. 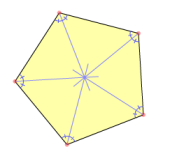 Irregular polygons have no incenter.